One of my very favorite times of the year is almost here! In my classroom we begin Christmas themed activities right after we get back to school from Thanksgiving break. We begin with our nativity theme which leads us right into a super fun field trip. And then after that we are all about gingerbread men, cookies, ninjas, babies, girls, and boys. If there is a book about gingerbread cookies, we are reading it, comparing and contrasting, and mostly talking about what in the world our reaction would be if one of our own gingerbread cookies got up and actually ran away! 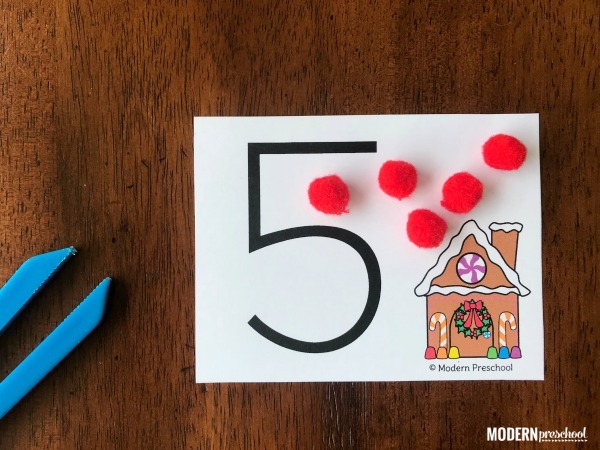 Our gingerbread fine motor number tracing cards fit perfectly into December and practice so many preschool skills! 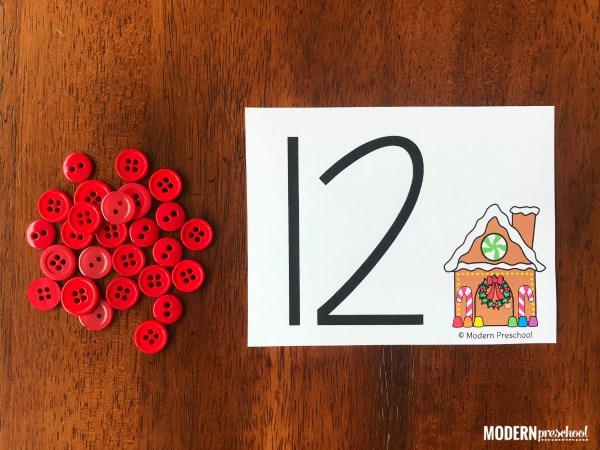 This free printable gingerbread fine motor number card set includes the numbers 1-20. Each card has a numeral and a cute gingerbread friend on it. Print the set of number cards that you will use from the file found from the pink button below. Cut them apart on the gray dotted lines. Laminate the set if you will use them in your classroom. I don’t know what it is, but my learning activity cards ALWAYS get folded and bent. It’s like my preschoolers’ little hands cannot help themselves and must bend them. So laminate the set. You’ll be glad you did! 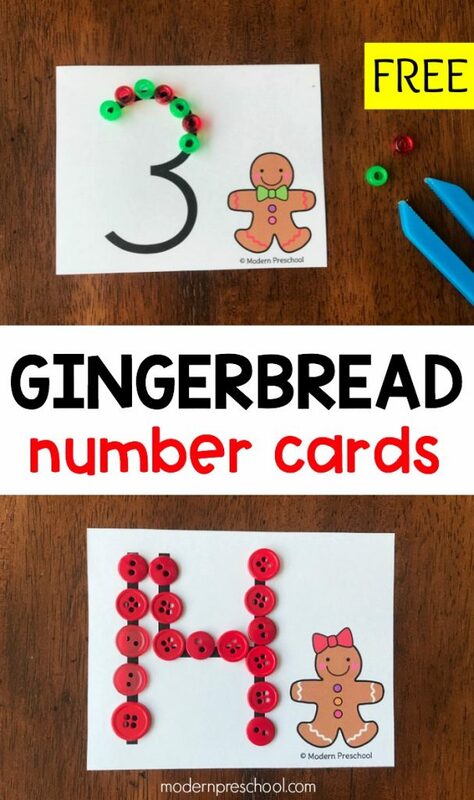 Place the gingerbread fine motor number cards in a basket or tray. Add buttons, beads, or pom poms to the set. And for even more fine motor practice, add kid-friendly squeezers, and you are ready to play, count, and learn! The object of this math center is to build (or trace) the number on the card with a tactile manipulative of some kind. My go-to materials are buttons, beads, dried beans, or candy. Gumdrops would be so fun for this number activity too! Pick a card and identify the number on it. Count up to that number or even count on from that number up to 30! After that, trace the number with your finger making sure to practice correct number formation. Now use those buttons to build the number by placing one button at a time on to the lines of the number. Fine motor skills will be strengthened with each careful placement of the buttons. It is important to remind your preschoolers to go slow. The buttons will be close together and will move and shift if placement is too hurried or sloppy. The goal is not to build the number quickly, but accurately. The number should be recognizable when all of the buttons are covering it. My preschoolers prefer to have new activities going all of the time. They love to walk into the classroom and see what they think is a new, everyone wants to play it first activity. What they don’t always realize is that I have taken the same activity we played yesterday, given it a slight make-over and TA DA…a new activity is created! Instead of buttons, consider using pony beads and kid-friendly squeezers. 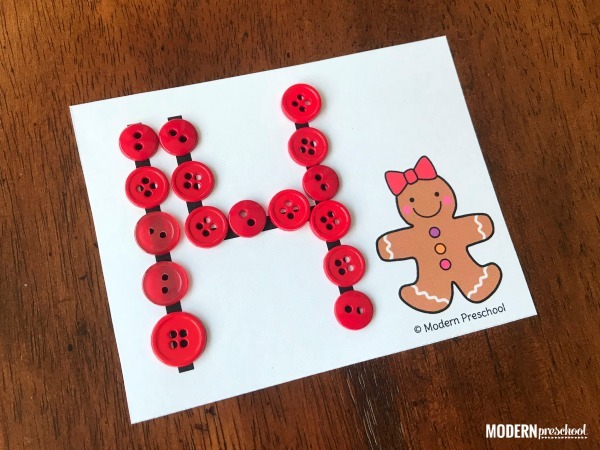 Our gingerbread fine motor number tracing cards can easily be revamped to include patterning too! Use red and green pony beads to create an ABA pattern on the numbers as you build them. A higher leveled way to play includes 1:1 correspondence and counting skills. Instead of building the number out of manipulatives, add the correct number of pom poms to the card! Use kid-friendly squeezers to place one pom pom at a time to the card. If the number is 5, add 5 pom poms. If the number is 20, carefully add 20 pom poms to the card trying to keep them all on the card! 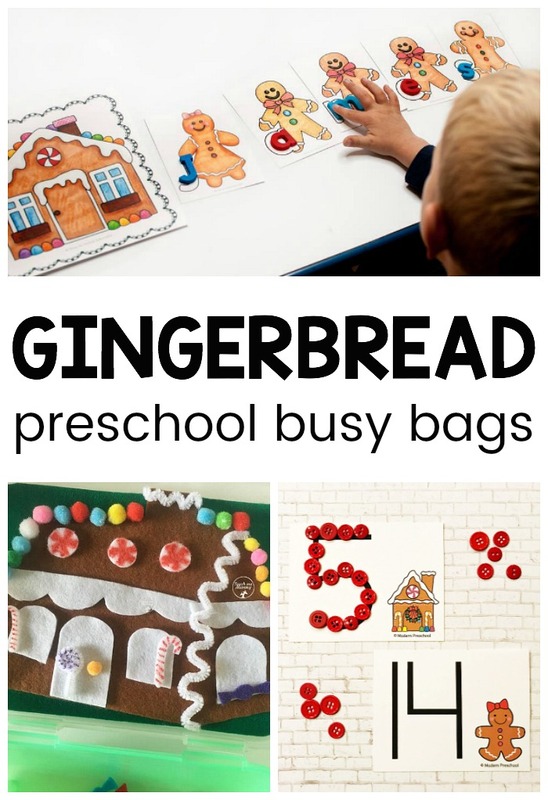 Now if your preschoolers are loving these early number and math center ideas above, they will also love the busy bag learning ideas from some of my favorite preschool bloggers! Which one is your favorite? Fine motor skills are such an important area to focus on with preschoolers. 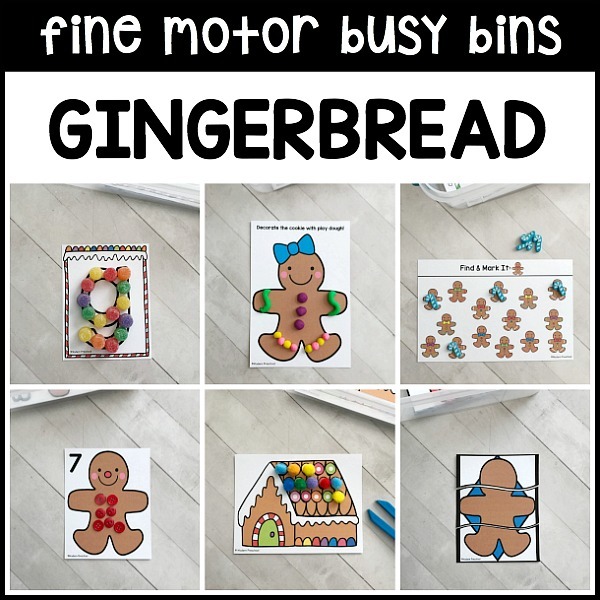 This is why our Gingerbread Fine Motor Busy Bins are beyond the perfect addition to your December learning ideas. Use them as welcome work, small group ideas for the younger set, or for simple, independent learning centers. Our busy bins were created to be low prep, save ink, and use those fun manipulatives (you know you love the themed mini erasers as much as I do!) that preschoolers should be working with each day. As you are prepping for your gingerbread theme, check out our Gingerbread Literacy & Math Centers too! 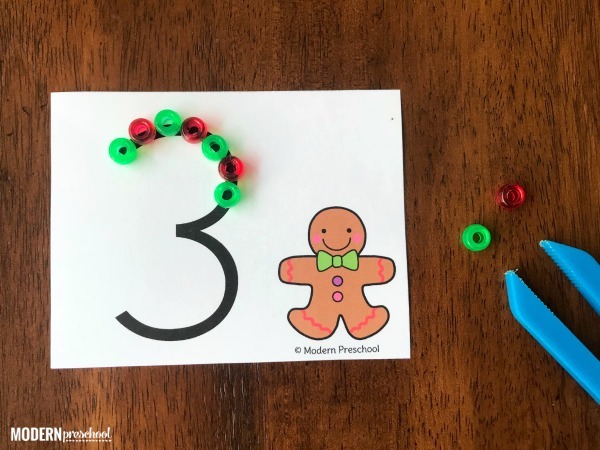 Grab your free gingerbread fine motor number tracing cards now!